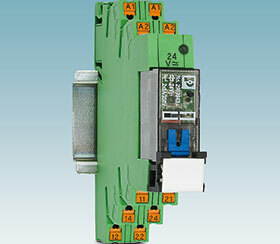 The PLC interface program from Phoenix Contact for relay modules now also includes modules with lockable manual operation in a 14 mm overall width. They are particularly suitable for efficient and time-saving maintenance as well as easy commissioning. The relay modules meet standard provisions for approvals in accordance with UL, EAC and are subject to the RTII degree of protection. They are available with screw-in and push-in connection technology, saving space in the control cabinet thanks to their slender design. As prefabricated complete modules, they are equipped with input voltages of 24 V d.c., 120 and 230 V a.c. Their modular design allows relay modules to be combined – even those with advanced functions.